For most of us, work is changing: We are more mobile than ever before, we work from home or rent coworking space, new generations of professionals grow up with messaging rather than email and telephony. With the latest release of our award-winning OpenScape Business telephony platform, we address dilemmas faced by many businesses: How to stay ahead of rapidly evolving communication needs, and how can established and next-generation collaboration technologies and behaviors coexist? Recent market data underlines this dilemma: According to the Digital Office Index 2018 published by Bitkom, the German IT trade association, 88% of businesses use fixed-line telephony 'frequently', 12% do so 'very frequently'. With 100% usage and against some odds, telephony remains the dominating business communication platform in the German and many other markets. 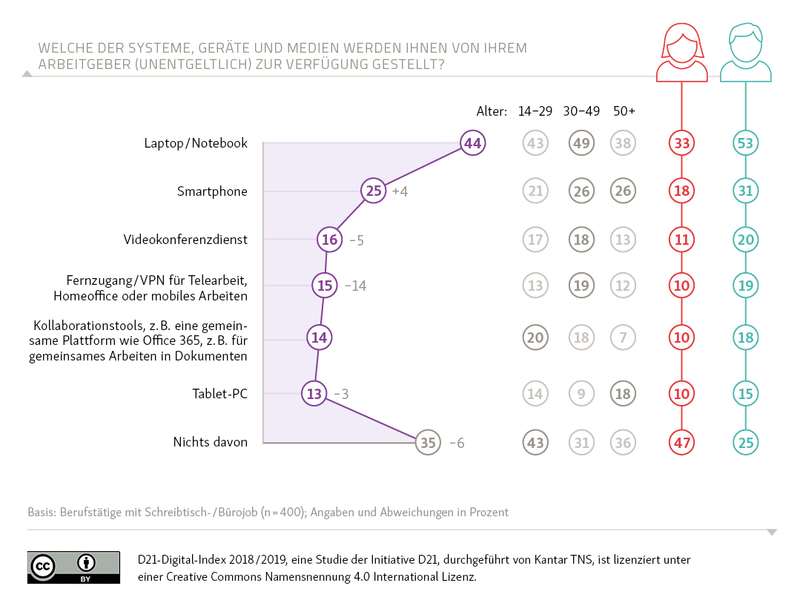 At the same time and based on data from the D21 Digital Index 2018/19, adoption of video and collaboration platforms lag behind. Despite changing work environments and needs, only 16% of employees say their company provides video conferencing solutions to support virtual teamwork. Even less (14%) have access to collaboration tools for document sharing, voice, video, screen share or team messaging, like Circuit. Survey: Which of the following systems, devices and media does your employer provide (free of charge)? With the current release of our OpenScape Business telephony platform, we offer deeper integration and coexistence of these two worlds, ultimately driving acceptance and preventing communication silos between voice and collaboration. Our OpenScape Business V2R6 (Release 2) enables the following popular telephony features in Circuit: Make, answer, hold, clear, reject, retrieve, forward and swap call, DTMF support, unattended call transfer, PBX voicemail handling, consultation call, and attended call transfer. We also support call control for connected desktop phones within the Circuit interface. Another key upside of our new integration is possible hybrid deployment options: Businesses can choose to keep their feature-rich and well-established telephony system on-premise — protecting their investment — and move to the cloud for team collaboration, benefiting from monthly Circuit updates with new capabilities and security fixes. “The rich set of telephony features is unrivaled for Unify‘s hybrid cloud collaboration approach with OpenScape Business and Circuit. Customers can protect their existing investment and add new collaboration and mobile services whenever they are ready”. Dennis Lohmann, Technical Director of B.I.S. Telefonsysteme GmbH, Germany. The combined solution can also be customized based on the needs of single users within the deployment, ranging from pure voice, unified communication and desktop call control, all the way up to full collaboration with web-based voice, video, screen share, messaging and file sharing in Circuit. Joris Geussens, consultant at BusinessCom, Netherlands. We believe that our integrated OpenScape Business and Circuit package solves our business and technology dilemma: How to acknowledge the persistent relevance of telephony for most business users in their daily lives, and leverage powerful, secure, always-current cloud collaboration platforms to support new work environments? We now have a better answer to this question for our partners and customers. As a Unify partner, please go to our portal [login required] for relevant sales and marketing information, including on how to set up connectivity in 3 simple steps (2 if you already use Circuit!). As a new customer, you can sign up and use Circuit free of charge at www.circuit.com.